Next to getting your passport out of the firebox, one of the best things about getting ready to travel is dragging the bag down from its shelf in the closet. Or it should be. I’ve never really had beautiful luggage and a lacquered Globetrotter will have to wait until I win the lottery and book the trip on the Cunard Line. Up until now, my favourite piece of luggage is a smallish duffle bag sort of thing that Mrs. E. and I bought in Ventimiglia, at the market. It’s a dark brown polished leather number with a ripped loop where the shoulder strap used to attach. It was our sole carry on for the 48 hour jaunt through NYC and New Haven and stood up to the task. But for something larger, we’ve had to make do with the large blue and grey, monogrammed duffles from Lands’ End that were given to me when I graduated from high school. No complaints; after all, they survived trips through Africa, Europe, the islands, and Middle West laundromats. But in terms of elegance, they are a bit… lacking. So it was with trembling excitement that I searched, clicked and bought a Mulholland Brothers canvas and leather Longhorn bag. (Just one, carry on rules and all.) It arrived today. That’s it, empty, hanging from my shoulder. 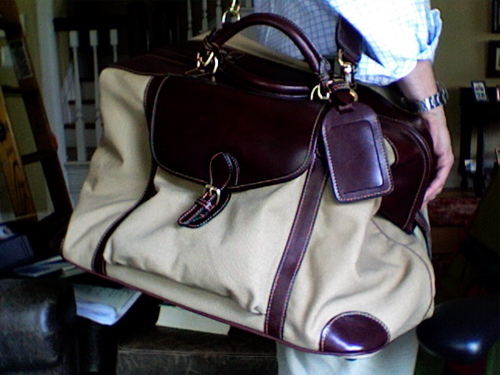 It’s bigger than I thought it would be, big enough to carry Mrs. E.’s and my things, which was the point… . And, having eyed the more expensive all leather numbers before “settling” on the canvas, far better looking in reality. 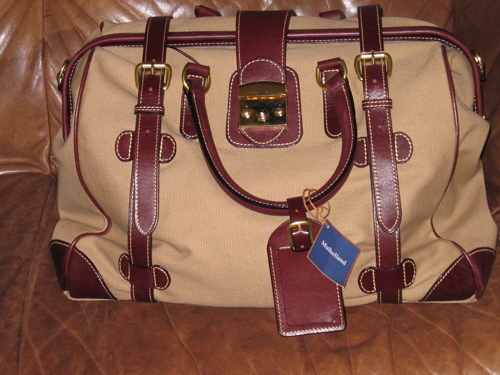 That the leather will match the little Ventimiglia satchel is a bonus. In fact, the only thing I regret is not ordering the Safari bag to match. Ah well, next tax season. With handcrafted products like these (mine was handcrafted in China according to Sierra Trading Post), Mulholland Brothers isn’t going anywhere. Although the company is only 20 years old, the website mentions that their signature Lariat™ leather was used to make saddles and saddlebags for Pony Express riders. Which means that they should survive the trials and tribulations of the overhead compartment on planes, trains and the boot in the car just fine. This entry was posted in Elegantology and tagged Elegantology, kit, resources, traveling. Bookmark the permalink. Well I hope I am not standing on the customs line with you. No, seriously, it is very chic and l love that market at Ventimiglia, we go every time we are visiting and always find something. Still kicking myself for not allowing myself to purchase a gorgeous leather bag, but there will be next time. You new bags will add a “saviore-faire” to your travels- bon voyage! Love the bag, what a stylish addition to your traveling equipage. Another purveyor worth checking out is T. Anthony here in NY, which has replaced Mark Cross (RIP) as the preferred carriage trade luggage store for the trad set. Also a great source for other monogrammed leathergoods, including jewelry cases, picture frames, guestbooks and albums, and my favorite — backgammon boards. Hello Mrs. PvE, the effect is somewhat ruined by the ziplock baggies of toiletries… Ventimiglia is a great market, isn’t it? It snowed once when we were there. Hullo Reggie! I have a wonderful picnic hamper from T. Anthony in Washington, D.C. . Great store. And good suggestion for the readers. It’s great, and will definitely lend an air of elegance to your travels.